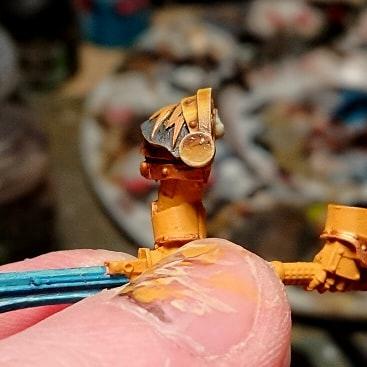 Thank you chaps, I've got a bit more done to the leg and started all of the pipework (trying to get a vulcanised rubber look to it using a brown base highlighted through to light grey, applied in small strokes). 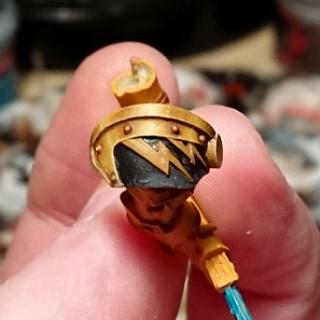 I was wondering about what colours to use on the helmet? 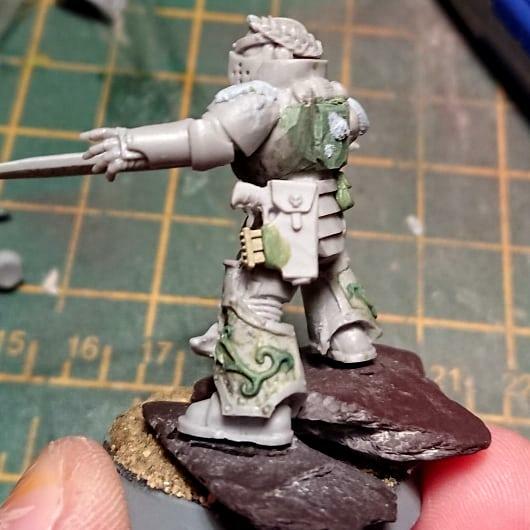 I do like the aesthetic of the red helmet with white stripe but this is usually reserved for Veteran Sergeants and since this dude is a Praetor Tribune, should I just do it yellow? Looking great so far. He does look funny without the front chest plate on though. For helmet, what about white, white with red stripe, black, or black with red stripe? 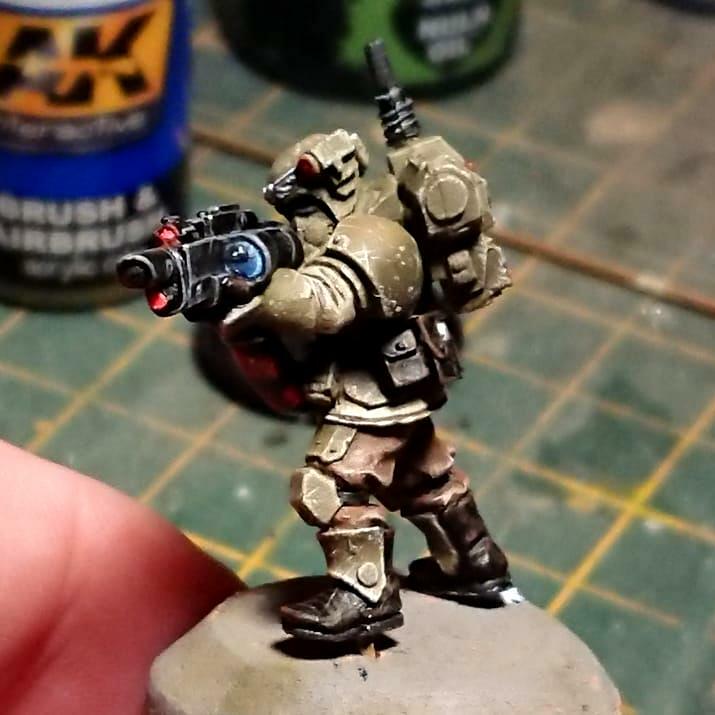 Desperately trying to improve my painting abilities. Unfortunately black still kicks my arse. Nice! 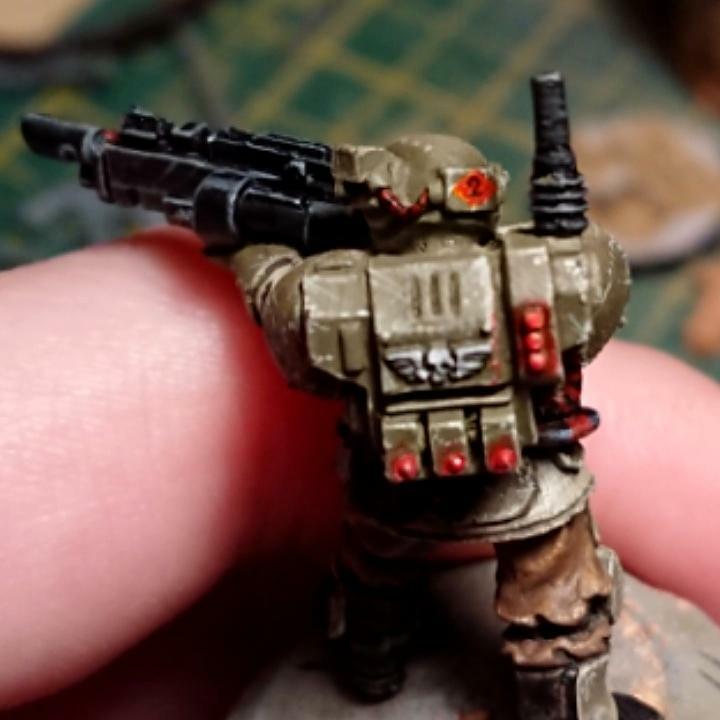 Great work on the lenses and the chipping on the armour. Thanks Paradigm. Still needs a bit of work... Got the other 4 in the first batch airbrushed and waiting for the edge highlighting and chipping. The most laborious part of these is painting the black weaponry but they are far more enjoyable than Space Marines (which I've decided I HATE doing). Looks good to me, man. I like all the lights. Thanks youwashock. Kinda going for a Dawn of War vibe on the lights while maintaining a quasi-realistic look. It's looking a bit grey, maybe? You do know just how amazing these guys look right? They are breathtaking bud. That's very kind of you to say so Cam, thank you. Done a bit of NMM on the sergeant's sword today to break up the edge highlighting and painting black (will need to revise the hilt because it's garbage at the moment). Sarge is looking legit, but I have a feeling that plasma gunner is going to steal the show. 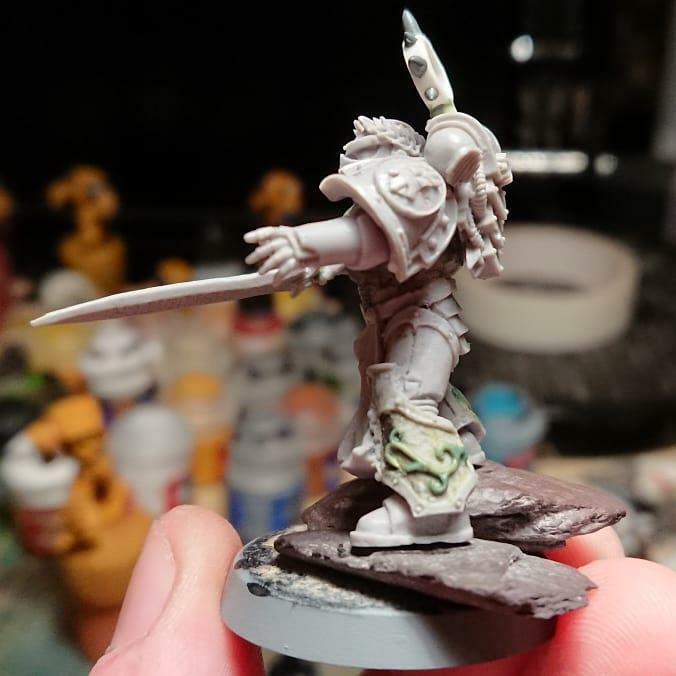 Sword is on the way in the form of the BT Emperor's Champion (because that sword is just lovely). 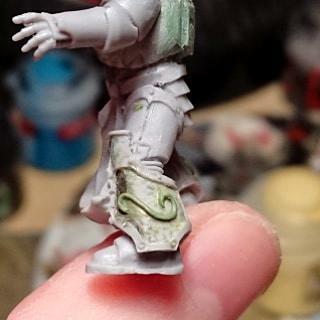 Will be adding extra details in the form of scrolls/filigree to the greaves and pouches. Really nice work, smooth and nice pose, like that alot. 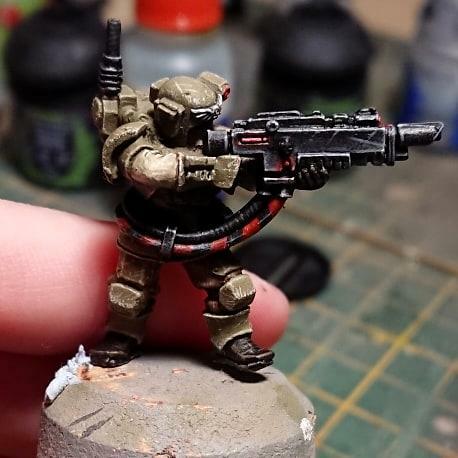 Having looked at the Iron Halo again, does it seem too high up on the backpack? Should I perhaps move it to that it's lower down/angle it so that it actually is a halo over the back of his head? Fantastic looking conversion. 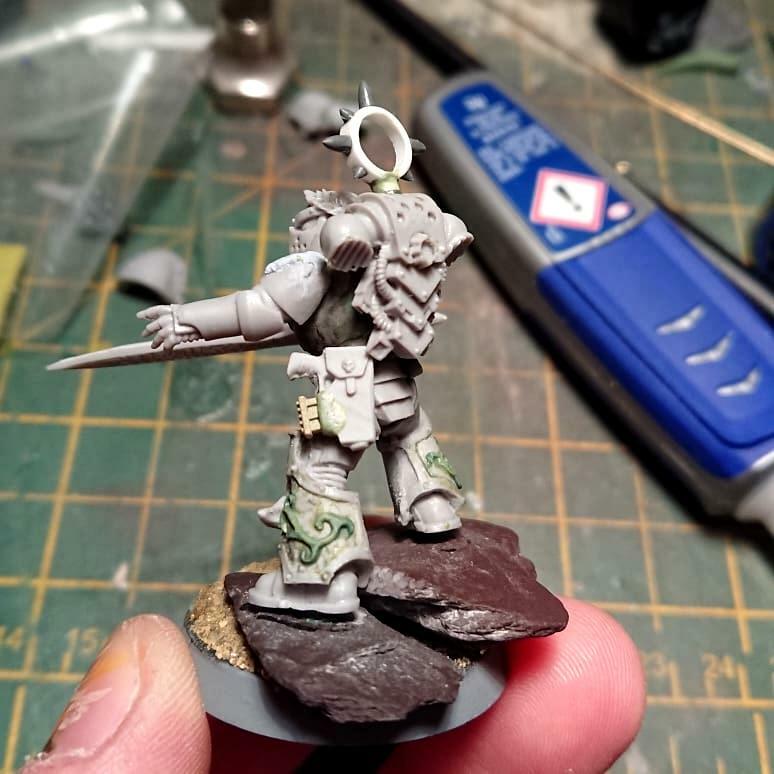 The halo may be a little high, but you might want to wait to change it until you have the sword in place. It may balance out the look. Great work! May I ask how you manage to cut out all those little circles from plasticard for the rivets on the tank? youwashock wrote: Fantastic looking conversion. 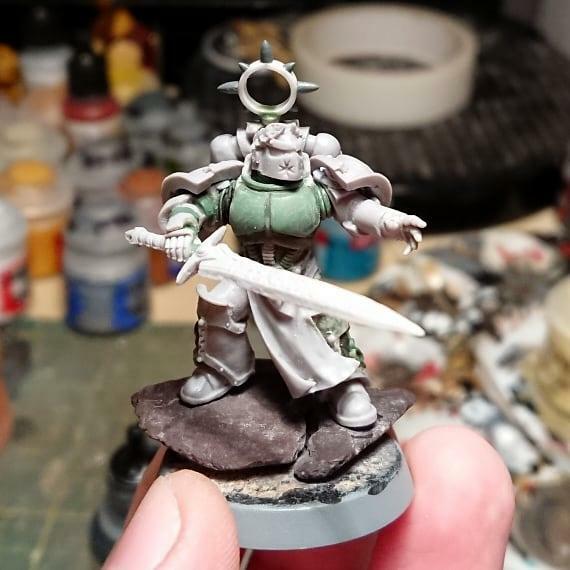 The halo may be a little high, but you might want to wait to change it until you have the sword in place. It may balance out the look. Kroem wrote: Great work! May I ask how you manage to cut out all those little circles from plasticard for the rivets on the tank? Thank you! I just use slices of styrene rod in various diameters. In order to get them all uniform, I actually give them a file or sand them once they are in situ. Hope that helps! Definitely needs some fixing on both sides as they aren't quite the same (though I may have to concede that I'll never get them identical). 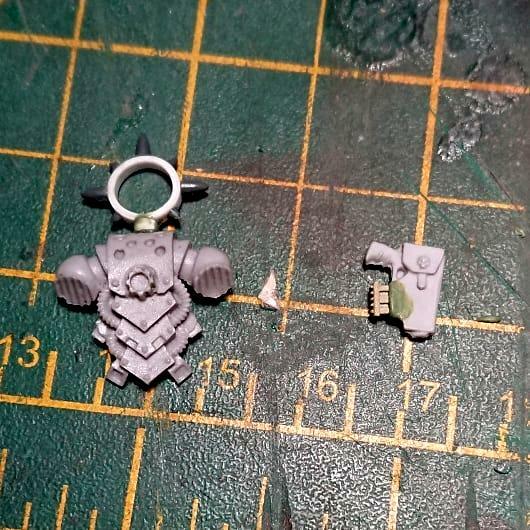 The emperor's champion turned up yesterday and I managed to swap the hand onto a Mk.4 wrist and flip the blade upside down so that the "Imperator Rex" faces up (because I'm sad). Will get some pictures of it together when I get a bit further. Those are nice touches you added on. Very similar too. I wouldn't worry if they aren't identical, you can't see both at the same time, right? A-ha! Yes, I suppose you're correct! I also appear to have exalted my own post as my thumbs have turned into mittens after a few beers... Derp. Next thing is to add the little leaves/additional flourishes to each greave and tidy up the right arm. Cheers mate, that helps a lot. I didn't even realise those things existed! 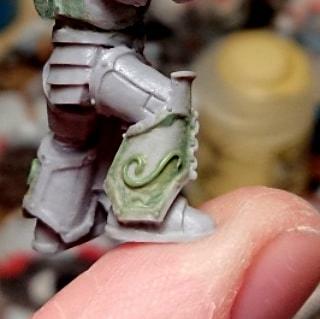 What are people's thoughts on the filigree stuff on his greaves? 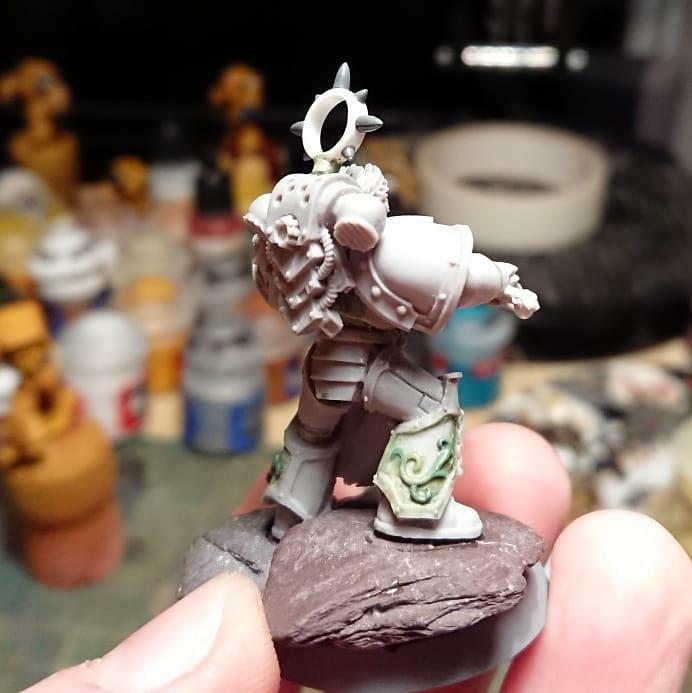 Have got to do his right arm, some pouches and... Paint? The filigree is my favorite part! Looks spectacular. The added points on the halo were a good call, too. I have the right wrist to finish filling in and some pouches to sculpt and then he's pretty much done. 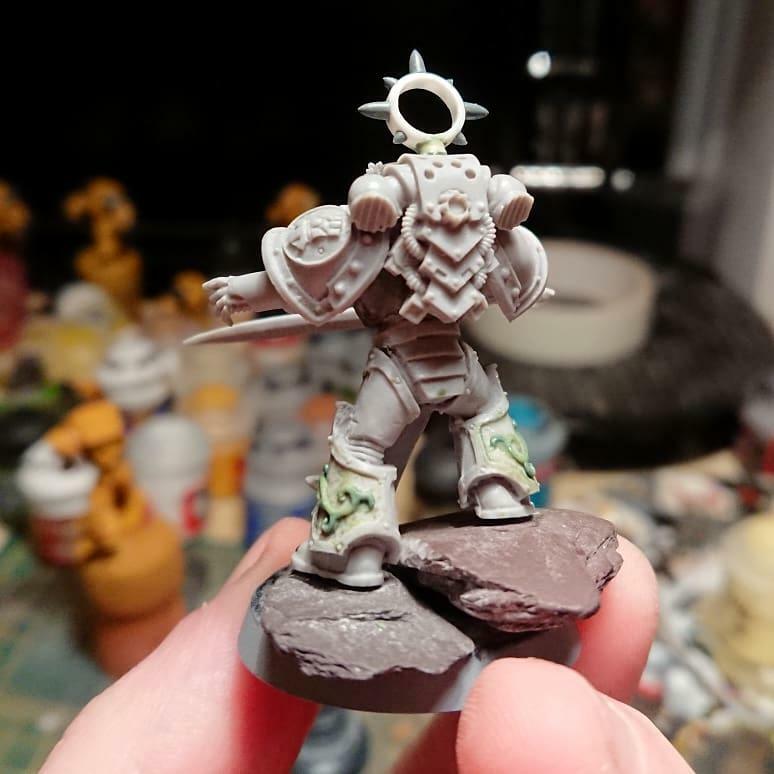 The base requires some extra detail (like a helmet or some such) and some sand added before painting can commence. Can I get an append up in heeyuh?